Ded Moroz and Snegurochka as Symbol of Christmas in Russia. Ded Moroz and Snegurochka are popular figures in Russia, especially in Christmas and New Year. Who are they? Orthodox Christianity is the most widely embraced religion in Russia. Like other Christians, Orthodox Christians also celebrate Christmas. But uniquely they celebrate Christmas not on December 25, but on January 7th. The difference in date calculations relates to the use of a new calendar by Pope Gregori in the Catholic Church in 1582 known as the Gregorian calendar. As for clerics in the Russian Orthodox Church still use the old calendar known as the Julian calendar. Julian Calendar in its calculations 13 days later than the Gregorian calendar. The tradition of Christmas celebration began after many of the Rus people who embraced Orthodox Christianity in the era of Vladimir I the Great. While the New Year celebrations became known in Russia since the 18th century. Its during the reign of Peter I the Great who held westernization by introducing the Gregorian calendar. Those calendar set the date of January 1 as holidays and New Year celebrations. In the Orthodox Christian tradition, they fasted to eat meat 40 days before Christmas. They stopped fasting after the first star appeared in the sky. Its on Christmas Eve on January 6 as a symbol of the birth of Jesus. In the evening, Orthodox Christians gathered to the church and prayed together. On Christmas Eve, some people practice the “Svyatki” tradition that comes from Ancient Slavs, where girls use mirrors and candles to see the image or shadow of their future faces in the future. This Svyatki tradition is almost gone along with the times. After the Russian Revolution of 1917, the Bolsheviks forbade the celebration of Christmas. Many of the traditions that were originally performed to celebrate Christmas. Especially those related to religious events were banned. It was not until 1935 that the Stalinist decided to allow for some Christmas traditions. Such as make up pine trees and share gifts, only at that time was no longer related to Christmas. Its because the time of its execution was put into a series of New Year celebrations. The difference Ded Moroz with the figure of Santa Claus of Western culture is the posture and color of her clothes. Ded Moroz was originally portrayed as a tall grandfather who wore blue clothing. But for now his figure is more often equated with Western-style Santa as a fat grandpa dressed in red. Nor did he ride a deer, but a sled pulled by three horses. Ded Moroz and Snegurochka as Symbol of Christmas in Russia. In addition, in Russian tradition, Ded Moroz did not work alone when distributing gifts. He is assisted by his granddaughter named “Snegurochka” or “Snow Girl”. These two figures also become symbols that are often associated with New Year celebrations in Russia. Ded Moroz did not come for Christmas, but for New Year. So Santa Claus comes in Desember, while Ded Moroz comes every January. The difference from the body is, Ded Moroz more taller than Santa Claus. Ded Moroz popular with tall grandfather. Its mean, he has more taller and big body than Santa. Ded Moroz has long beard, while Santa Claus has short beard. 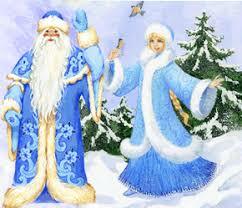 Ded Moroz can wear coat in another colour than red, such as blue or white coat. But Santa claus always in red coat. Here Santa Claus wears : a night cap with a bob, short jacket, gloves, and black boots. Ded Moroz dressed more warm than Santa Claus. He wear a warm fur-coat and fur-hat, mittens, and felt boots. Ded Moroz have staff in his hands to helps him to walk across snowdrift. While Santa Claus have not staff. Santa Claus’s accessories are glasses, while Ded Moroz haven’t. Ded Moroz accompanied by his granddaughter called Snegurochka (Snow Girl or Snow Maiden). But Santa Claus didn’t accompanied by anyone and also known to have a wife. Ded Moroz walks on foot or he ride a deer, but a sled pulled by three horses. While Santa Claus travels by air on sleigh pulled by reinders. Usualy, Ded Moroz comes to the front door of houses, meanwhile Santa Claus comes through a chimney. Santa Claus identical with somebody’s sock, but Ded Moroz present his gift under the Christmas tree.